but still more to go. Over the past few evenings and having the day today I was able to put another serious dent in the reorg of my shop. I have officially gotten everything moved around to about where I want it. The major push (and I mean it physically) was to get my lumber cart moved over to the wall that is just bare concrete and therefore not good for hanging anything. So here is what the back of the shop looked like last week. With a bit of pushing and some help from those little plastic moving pads under my lathe. Here is what the back of the shop now looks like. I am loving the fact that I was able to get my microwave finally set up for drying some wood. 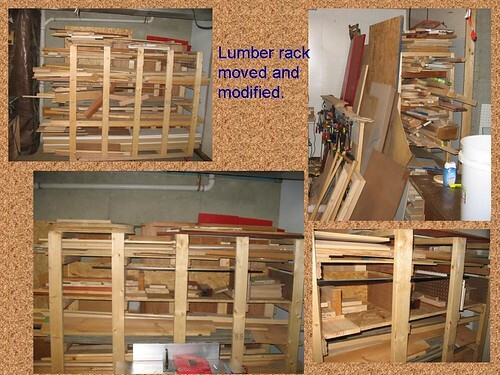 My lumber rack> is just over 3 years old now and has served me well but I stacked a bunch of stuff on it at the back and could never get to it. With it now residing against the opposite wall and the sheet goods against the wall I have a lot more accessibility to it. I did decided to make a bit of a modification by adding bins in one rack levels, these will serve to hold some of my smaller cut offs I want to keep. I really need to cut back on the amount of little stuff I keep. I am going to try very hard to be getting rid of more pieces. Fortunately it will not all go to complete waste, as my daughter’s daycare loves getting boxes of scrap that the kids can build things with. 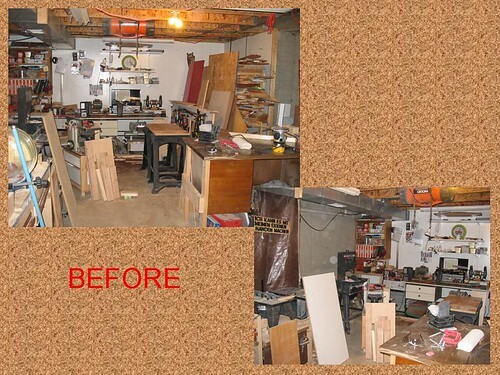 I am however going to go through a large dumping area in my shop tomorrow and clean that out. I’ll post more on that one later this weekend. Hoping to get a lot out to the curb before trash day on Monday. 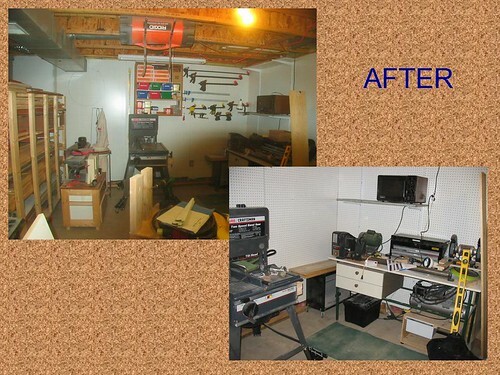 Once that is done my focus will be on building some new tool holders and storage items. Great change. How do you keep your electronic free from dust? Thanks Karson, not sure which electronics you mean. The microwave is an old dial on so that works pretty good. Dust control in general though is going to be a big part of this year. I’ve swept up way too much of it this week. The wires going up from the bench made me think that you had a stereo sitting on your bench. I guess I should have looked deeper. Awsome job! Doesn’t it make you feel so good to have a clean shop? I know it does me! Looking very ‘businesslike’ I think we can all relate to your problem with cut.offs.